Toyota’s RAV4 has quietly become the best-selling vehicle in the U.S. that isn’t a pickup truck, supplanting its sibling Camry sedan, which long held the title. Now Toyota is out with a redesigned RAV4, making several improvements that have transformed a sometimes boring model into a true five-seat adventure vehicle. For its fifth generation, Toyota debuted a completely revamped vehicle. 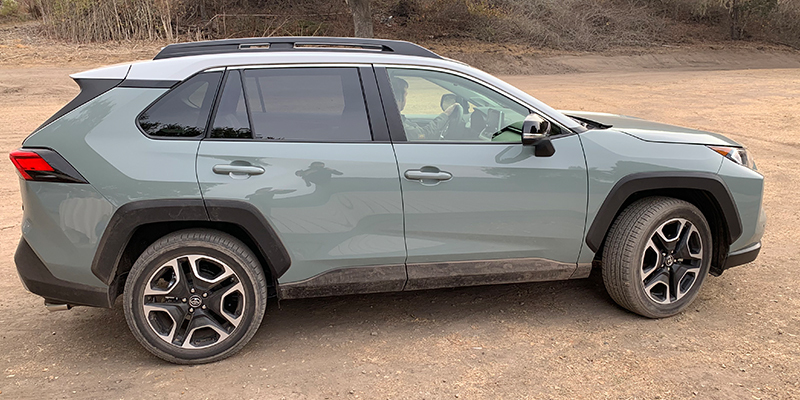 The 2019 RAV4 is wider and lower, portraying a more athletic stance. There’s also an all-new variant – Adventure – that looks even burlier and has standard all-wheel-drive. Its top trim – the XLE Limited – sits on 19-inch wheels and comes with a digital rearview mirror. The base LE is available in AWD and forward-wheel-drive, as are the XLE, XLE Premium and pricier Limited. An AWD hybrid powertrain is available in all trims but Adventure. Pricing starts at $25,500 for the FWD LE and jumps to $34,900 for the AWD Limited. The hybrid lineup starts at $27,700 and tops out at $35,700. Each trim comes standard with roof rails and a handful of driver-assist technology like adaptive cruise and lane-keep assist. No matter the trim, there’s a RAV4 for every type of adventurer, including those who only tackle gridlock. Trucks.com took the RAV4 down the twisty highway roads and off-road terrain in Carmel-by-the-Sea, Calif. After logging 100 miles, the major takeaways are clear: The Adventure trim, which starts at $32,900, wears its moniker well. The 2019 RAV4 is a compelling vehicle. Its new Adventure trim tackled loose gravel, packed dirt and sand with ease, leaning heavily on the vehicle’s dynamic torque vectoring, which transfers power to the tires that need traction. An in-dash icon identifies which tires get the boost. The Adventure’s all-terrain capability is a sum of its parts. Downhill Assist Control – a feature that controls the acceleration and braking on steep grades – provides a helpful assist when navigating technical descents. When ascending or descending precipitous hills, Hill-Start Assist gives drivers just under 3 seconds to transfer their foot from the brake to the gas without the vehicle rolling. The digital rearview mirror – a first for Toyota’s North American lineup – displays a clear picture of the road behind when the rear is stuffed with cargo. It toggles back to its standard mirror function with a button. The Adventure also is enjoyable on the highway, offering a consistently smooth ride. Some engine sound floods the interior, but it’s bearable over long distances with music in the background. Its infotainment system – Toyota Entune – which is displayed on a 7-inch touchscreen display, is easy to navigate. Switching between functions such as radio, its built-in navigation and vehicle temperature control is straightforward. It also offers voice commands to allow the driver to alter navigation directions even while the vehicle is in motion. However, apps that aren’t compatible with voice commands lock both the driver and passenger out while driving, and are only editable when the vehicle is stopped. The RAV4 also offers Apple CarPlay compatibility, a must-have for adventure vehicles, and has the new Waze app integration for drivers who prefer that map platform. Toyota also includes Amazon Alexa compatibility, which offers voice-activated commands for music, weather or news. Each RAV4 includes 5 USB ports. The suite of driver-assistance technologies on the RAV4 Adventure mixes in a new pedestrian-detection system that, in addition to reducing speeds before a collision, can sense cyclists in low light. The system also flashes upcoming road signs on the display, a helping hand when navigating unfamiliar territory. The speed limit also is displayed next to the speedometer when a sign is detected. Toyota’s lane-keep assist feature, which only works in cruise control mode, excels on long stretches of highway, although it does tend to hug the center-lane line. But the system moves the wheel steadily. Availability of adaptive cruise, which Toyota calls Dynamic Radar Cruise Control, makes the RAV4 a prime road tripper. The feature uses a radar to match its speed to the vehicle in front. The system is alert and slows the vehicle without haste, even when following closely. Toyota’s initial design focus was to give the RAV4 the swagger of a larger SUV. This means increased outward visibility for the driver, improved driving dynamics and upgraded proportions. At 73 inches, the width of the 2019 RAV4 increased by .4 inches compared with the generation it replaced. Toyota also stretched its ground clearance 2.3 inches to 8.4 and gave it a boxier, SUV-like shape. It can tow up to 3,500 pounds. The front fascia also now features a grille, adding to a more mature aesthetic. The Adventure trim gets its own front grille and bumper design. The RAV4’s cargo area is spacious enough to store skis and snowboards with the rear seats folded down. A 60/40 split also provides storage flexibility without compromising the entire rear seat. However, the layout could have been designed more efficiently. With roughly 37 cubic feet of space in the back, it trails the Ford Edge ST by nearly 2 cubic feet. An adjustable two-level deck board does grant two more inches of height. Additional trunk amenities include a plastic deck mat that makes for easy cleaning, a 12V/120W AC power outlet and a foot-activated liftgate. Small-item storage is in abundance. There are eight cup and bottle holders as well as illuminated storage areas on both the passenger and driver sides. Other upgrades include a rear spoiler, standard LED headlights and projector LEDs on the midlevel XLE, XSE and Limited trims. 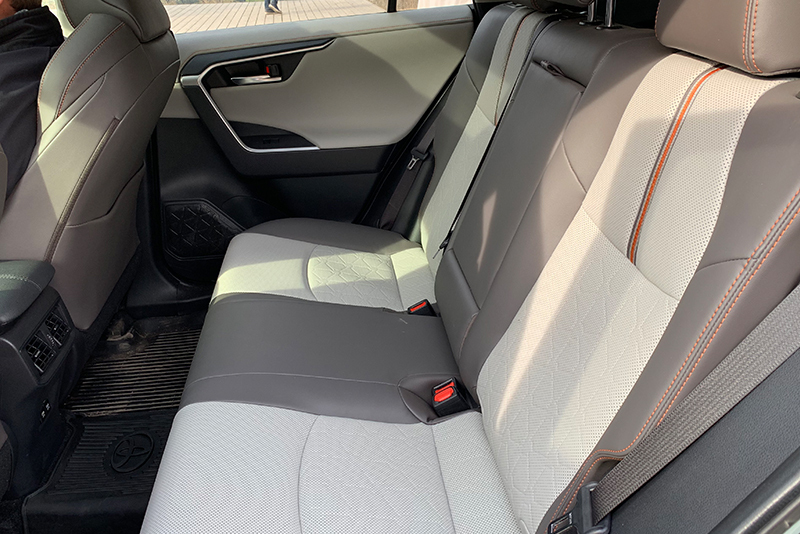 Heated and ventilated Softex leather seats are also standard on these trims, another facility of adventuring importance. Sweat, blood and dirt don’t wipe out of cloth seats as easily. The RAV4 is powered by a 2.5-liter 4-cylinder engine that delivers 203 horsepower and 184 pound-feet of torque. Its eight-speed electronic automatic transmission features a sequential shift mode, as well as a special Snow Mode. Its suspension uses independent MacPherson struts for its front and a trailing wishbone-style multilink rear suspension. The Environmental Protection Agency rates the RAV4’s gas mileage at 24 mpg city, 32 highway and 27 mpg combined. The hybrid powertrain offers 39 mpg combined and 219 horsepower. The RAV4 goes on sale this month. The hybrid option hits showrooms in late March 2019. Editor’s note: To facilitate this report, Trucks.com attended an event at which Toyota hosted travel and lodging.